Crowd funded science – is this the future? Is our future one where antibiotics don’t work and crowd funding basic research is the only solution? Crowd funding is becoming the accepted way to market for cool gadgets, electronics and even events. But science? The overuse of antibiotics in medicine and agriculture is leading to a world where treatable bacteria are outnumbered by drug-resistant strains. Dr Mel Thomson from Deakin University is already seeing the everyday evidence of this happening in hip-replacements. Some patients’ implants become infected and the infections can’t be treated with available antibiotics; repeat surgeries are required and all too often joint replacement becomes impossible – leaving them without hips. So due to the failure of currently available antibiotic therapies people are literally being left without hips. …set up an in vitro R&D pipeline (consisting planktonic bacteria models, bacterial biofilm models, tissue culture models) to test novel antimicrobial agents (supplied Collaborators at Deakin and Monash) using glow in the dark (bioluminescent) bacteria and clinical isolates obtained from collaborators at Barwon Health and RMIT. Once set up, it can be used as a high through put model to assess the efficacy and toxicity of novel antimicrobial compounds before further testing. There’s clearly a conceptually fine line between crowd-funding and charitable donation that is pretty blurred here. Normally backing a crowd-funded project will see you receiving something directly from the project. In this case the rewards, sadly, do not include a vial of a new strain of antibiotics. Instead backers contributions are tax-deductible and the rewards are pieces of broadly related artwork. Crowd-funding science research is an interesting idea and, in the current Australian political climate, seems like more of a necessity than a luxury. To separate it out from a charitable donation I’d personally like to see rewards that focus on the project itself: Private updates from the researchers, a chance to visit the lab, even a petri-dish named in your honour. Dr Thomson and her team have a great idea here – both in terms of what they are trying to achieve and the way they are going about it – an interesting experiment on all fronts. 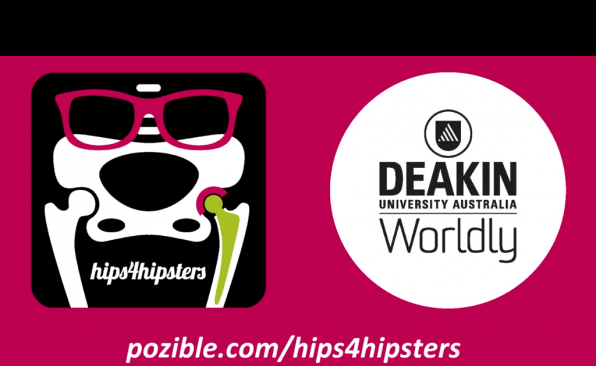 You can find all the details on, and contribute to, Hips for Hipsters Pozible campaign here.